While on one of our infrequent, paganly timed works drinks outings that usually start in a pub called The Old Joint Stock I spotted a new luxury soft drink range. This is always a cause for celebration and so I ignored all the calls of 'you want a what?' and ordered a Cornish Orchards Lemonade. 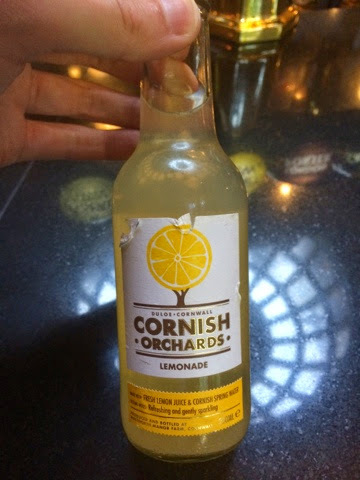 Made with Cornish spring water and presumably locally sourced lemons (forgot to look - oh dear have to buy another) this is definitely an adult soft drink. The flavour isn't as sharp as Fentimans and is very much a soft soft drink. I did enjoy it and it's nice to have options for when you don't fancy the explosive end of the flavour spectrum. I was going to order a second to go with my meal, but then decided to get the apple juice by the same company instead. I didn't take the bottle from the bar (rookie mistake!) so here is a picture of my gourmet burger instead. Monday night is gourmet burger night at the Old Joint Stock and they even have a chef. It shows and this was very nice indeed. People were on the fence about buying food until the orders started to arrive, and in really enjoyed my Boar and Apple burger. Still confused by the big chips, although I did get to play a solitaire version of Jenga. 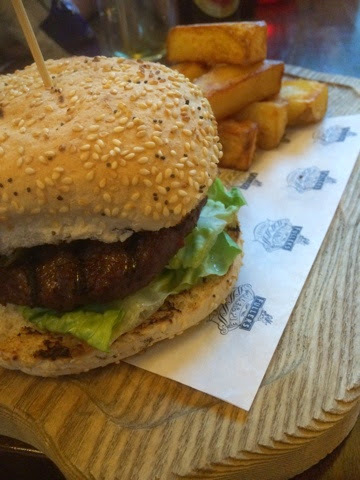 I had the apple juice with the burger and again it was less strongly flavoured than the Inocent apple juice which is my brand leading go to for that but it did complement the food nicely and didn't overpower it. I think that these drinks would suit those who want something more exciting than the syrups from the hose that most places sell (which don't get me wrong certainly have their place), but that find fever tree and Fentimans too intense. They'd probably be good mixers too. We will be back there soon enough so I'll get to try the other varieties and see what the pies are like.